Stay up-to-date with all of the 2019 NASFAA National Conference news and updates. Several Department of Education (ED) interest sessions will be offered at the 2019 NASFAA National Conference in Orlando and the popular "Ask a Fed" table will be set up in the exhibit hall so you can stop by to discuss Title IV-related questions with ED staff. Scheduled sessions will address today’s hot topics, including administering aid for transfer students, 2020-21 FAFSA updates, cybersecurity and data protection, SULA misunderstandings and misreporting, and verification. Check out the full conference schedule for details about more great sessions. We're excited to announce that the full conference schedule is now available! Browse the full schedule, sort sessions by track, or search for particular presentations using keywords, a speaker's name, an exhibitor, or the session title. Early-bird pricing ends in two weeks, on April 26. If you haven't already, register now to join us June 24-27, 2019 at the Walt Disney World Swan & Dolphin Resort in Orlando for what is sure to be an engaging and informative conference. Can't make it in person? Register for NASFAA Live, our livestreaming option. The NASFAA conference is a team effort! When we convene in Orlando, please help us thank our gold level sponsor, LendKey, for their financial support and on-site participation that makes our conference so valuable to you, our attendees. Our sponsors are a key piece of the puzzle as they help make it possible for NASFAA to provide financial aid training, networking opportunities, and professional development at the conference. Check the schedule for all the special events in the Exhibit Hall. The NASFAA National Conference is a team effort! When we convene in Orlando, please help us thank our platinum level sponsors—College Ave, Discover Student Loans, Earnest, Inceptia, Oracle, Sallie Mae, and SoFi Lending—for their financial support and on-site participation that makes our conference so valuable to you, our attendees. Our sponsors are a key piece of the puzzle as they help make it possible for NASFAA to provide financial aid training, networking opportunities, and professional development at the conference. Check the schedule for all the special events in the Exhibit Hall. Register now and join us June 24-27, 2019 at the Walt Disney World Swan & Dolphin Resort in Orlando for what is sure to be an engaging and informative conference. Need help explaining to your manager the return they will see on this important investment in your professional development? NASFAA has created a toolkit of easily customizable letters and worksheets you can use to make your case. Early-bird pricing ends April 26. Register now. NASFAA's National Conference is just three months away! Nearly 2,300 student aid professionals from across the nation will come together June 24-27 in Orlando to teach, learn, and share best practices. In addition to the valuable training provided, the conference is a great opportunity to network with your colleagues. If you've already registered, check out the attendee rosters to see who else from your state is planning to attend, or to browse by institution/organization or last name. Spring is upon us and that means the 2019 National Conference is just around the corner! If you're planning to join us in Orlando in June, be sure to check out our Orlando Travel Guide page for suggestions on fun things to do in your free time, or activities your family will enjoy while you're in conference sessions. From the Magic Kingdom and Epcot, to International Drive and dining in Orlando, we have you covered. 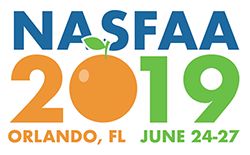 Are you registered for the 2019 NASFAA National Conference in Orlando this June? Consider flying in early to take advantage of training that will help you become more proficient, more knowledgeable, and more valuable to your organization. NASFAA U is offering two in-person pre-conference courses at no additional cost to attendees: Satisfactory Academic Progress and Administrative Capability. Those who attend will receive a test voucher at the end of the training session for the corresponding credential test. Attendance is a requirement for exam access. Availability is on a first-come, first-served basis, and space may be limited. Check out the Pre-Conference Sessions page for more information, including how to indicate your attendance preference. Attending the NASFAA National Conference for the first time can be an overwhelming experience, even more so if you are attending alone. We want attendees to have a great time and come back year after year. While NASFAA has always hosted a welcome reception for first-time attendees, we continue to look for creative ways to help first-time attendees connect with colleagues. All members of this task force will be required to attend the 2019 NASFAA Conference and participate in conference mentor activities prior to the conference and on-site. Please review the task force charter on the volunteer information page and complete the volunteer form by March 15, 2019 at 5:00 p.m. ET, if interested. Are you registered for the 2019 National Conference in Orlando this June? Registered attendees have the option to attend one of three pre-conference sessions at no additional cost. Looking to focus on professional development? Take either the Satisfactory Academic Progress or Administrative Capability NASFAA U course before the conference. Or, attend a session on promoting and responding to student mental health with guest speaker Barbara Blacklock, who for the past 12 years has been the co-chair of the University of Minnesota Provost's Committee on Student Mental Health. Check out the Pre-Conference Sessions page for more information, including how to indicate your attendance preference. Now more than ever, the NASFAA National Conference serves to provide you with the training resources, political realities, and advocacy pathways you need to succeed in student aid administration. NASFAA has created a toolkit of easily customizable letters and worksheets to help your manager understand the return they will see on this important investment. Check out these resources today to ensure that you can register before spots fill up. Early-bird pricing ends April 26. Are you joining us for the 2019 NASFAA National Conference in Orlando, FL this June? Each year more than 2,300 financial aid professionals from colleges and universities across the country come together at the National Conference to teach, learn, network, and share best practices. Check out this short video to see more about what to expect at the conference, and hear from your colleagues about their experiences. NASFAA is accepting volunteers for the 2019 National Conference Local Arrangements Task Force, one of two task forces that assist in planning of the 2019 NASFAA National Conference. Duties include of soliciting volunteers for the registration and information desk; overseeing the on-site information desk; providing local information for posting to the NASFAA website and inclusion in Today’s News; and assisting with performers as needed. View the task force charter and volunteer today. It may seem early, but popular restaurants in Disney parks and in Orlando book up very far in advance. Find dining suggestions on our Orlando Travel Guide page. You can also find staff suggestions for fun things to do in Orlando during your free time, or activities your family will enjoy while you're in conference sessions. From the Magic Kingdom and Epcot, to International Drive and dining in Orlando, we have you covered. Can't make it to Orlando this year for the 2019 National Conference? No sweat. You can actively participate in the conference from the comfort of your desk or conference room with our interactive streaming option, whether you're a NASFAA member or not. Simply register for NASFAA Live and log on June 24 -27, 2019 to watch all our general sessions and 24 pre-selected interest sessions on your computer or mobile device. Visit the NASFAA Live page for more details, pricing information, and to register for NASFAA Live. The college years are the time when many significant mental health conditions first manifest, and they can be a time of significant stress and pressure for students. Student mental health has become the number one public health issue on college campuses. Conference registrants, we invite you to join us Monday, June 24 at 1:30 p.m. ET for a complimentary pre-conference event on student mental health issues, led by Barbara Blacklock. You'll learn how to identify and respond to students in distress, how to identify campus partners to address the needs of students in distress, and more. NASFAA is thrilled to have best-selling author Steve Pemberton as the opening session speaker at the 2019 NASFAA National Conference in Orlando, FL. Pemberton will share his inspirational story of how he overcame seemingly insurmountable beginnings and went on to become a successful corporate executive, innovative diversity and inclusion thought leader, and acclaimed speaker. Join your colleagues for what is sure to be an exciting opening to the 2019 NASFAA National Conference. We're excited to announce that registration is now open for the 2019 NASFAA National Conference. This year, there are two ways you and your staff can participate: register to attend in person and join us on-site at the Walt Disney World Swan & Dolphin Resort in Orlando, or register for "NASFAA Live"—our web-based, livestreaming conference option, so you and your staff can actively participate in the conference from the comfort of your own office. Whether in Orlando or from afar, we hope you'll join us June 24-27, 2019 for what is sure to be an engaging and informative conference.